The Parliament House website currently lists all of the Bills and Legislation that are either in the House of Representatives, before the Senate or have received Royal Assent. A search will give you a full list of all current Bills and Legislation for Treasury under the 45th Parliament. Follow the link above along with the instructions below for a full list of current Bills and Legislation. Enter Treasury into the Keyword(s) field. Un-tick the Bills title only box. 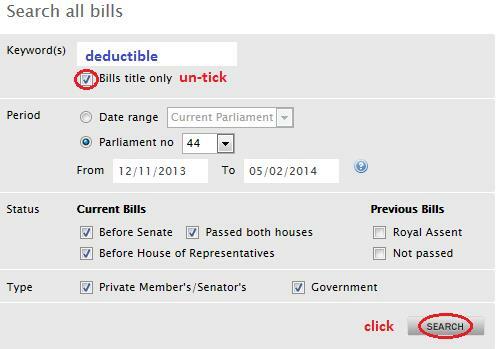 Enter Bill title (all or part of) into the Keyword(s) field. Enter measure into the Keyword(s) field.